Author: Allen, Reginald E. Set In . . .
Plato’s Euthyphro is important because it gives an excellent example of Socratic dialogue in operation and of the connection of that dialectic with Plato’s earlier theory of Forms. Professor Allen’s edition of the dialogue provides a translation with interspersed commentary, aimed both at helping the reader who does not have Greek and also elucidating the discussion of the earlier Theory of Forms which follows. 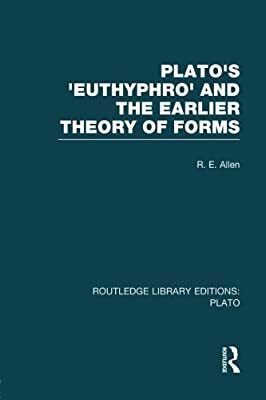 The author argues that there is a theory of Forms in the Euthyphro and in other early Platonic dialogues and that this theory is the foundation of Socratic dialogue. However, he maintains that the theory in the early dialogues is a realist theory of universals and this theory is not to be identified with the theory of Forms found in the Phaedo, Republic, and other middle dialogues, since it differs on the issues of ontological status.